‘Rock’ your little one’s world with the Storkcraft Wooden Rocking Horse. The rocking horse’s back and forth motion will aid your child’s sensory development, while adding vintage charm to the nursery. 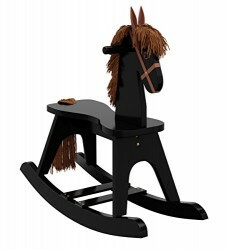 With its classic wood design and textured hair, this rocking horse is available in multiple non-toxic finishes to match any room decor. Made of high-quality, sustainable rubberwood (hardwood) and composites, the Storkcraft Wooden Rocking Horse is tested to meet all federal safety standards. Our products are designed for families, by families. Since 1945 Storkcraft has focused on what special family moments really need. We promise quality furniture that ensures safety & encourages our customers to create their own special place for children.